Dimensions 1 by 4 by 6.50 in. 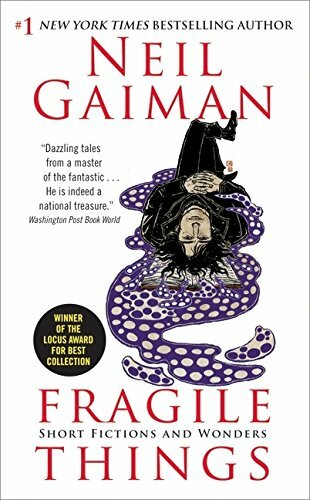 Fragile Things is a sterling collection of exceptional tales from Neil Gaiman, multiple award-winning (the Hugo, Bram Stoker, Newberry, and Eisner Awards, to name just a few), #1 New York Times bestselling author of The Graveyard Book, Anansi Boys, Coraline, and the groundbreaking Sandman graphic novel series. A uniquely imaginative creator of wonders whose unique storytelling genius has been acclaimed by a host of literary luminaries from Norman Mailer to Stephen King, Gaimanâs astonishing powers are on glorious displays in Fragile Things. Enter and be amazed! About: A collection of more than twenty-five short fictional works follows a theme of the intersections between life and death, perception and reality, and darkness and light. About: “A prodigiously imaginative collection. About: A collection of more than twenty-five short fictional works includes a novella featuring the hero from his best-selling American Gods, in a volume that follows a theme of the intersections between life and death, perception and reality, and darkness and light. About: In this dazzling collection of more than twenty-five pieces of short fiction, including a novella featuring the hero of his masterpiece, "American Gods," internationally bestselling author Neil Gaiman charts the terrain between life and death, perception and reality, darkness and light.